The big giant of the playing card industry today is unquestionably The United States Playing Card Company (USPCC), synonymous with the famous Bicycle® brand of playing cards. Despite the thriving industry of custom decks, the Bicycle deck is still the signature deck that you can expect to find in the hand of most experienced card handlers. But Bicycle decks only represent part of the many playing cards that USPCC produces. In fact, if you own a deck of custom playing cards, there is a good chance that it was made by USPCC. There are some competing publishers, to be sure, but when it comes to producers of quality playing cards, there is no doubt that USPCC is the big fish besides which most other publishers look like minnows. The history of the United States Playing Card Company goes back a long way, in fact all the way to 1867. That is when A.O. Russell and Robert J. Morgan, with the financial support of circus showman John Robinson, bought the printing section of The Cincinnati Enquirer in Ohio. Given their connections with the entertainment industry via Robinson, their initial focus was on printing posters for theatres and circuses. Under the name of Russell, Morgan & Company, they began printing a range of brands of playing cards in 1881. The company underwent a few name changes, but a particular significant one occurred in 1894. By this time, the playing card business had grown so much that there was a need to separate it from other printing interests, and so began The United States Playing Card Company as a separate entity. Since that time, USPCC has assimilated many smaller printing companies and producers of playing cards, including Arcco Playing Card Company (1987) and Hoyle (2001). In some cases they have retained the names of the brands and product lines that they inherited, since this made good commercial sense. As a result, today they are easily the biggest playing card manufacturer in the USA, producing not only popular brands like Bicycle®, Bee®, Aviator®, Tally-Ho®, and Hoyle® (all registered trademarks of the USPCC), but also producing many custom playing cards besides these well-known brands. All this means that playing cards from USPCC have the benefit of more than a century of experience and know-how. 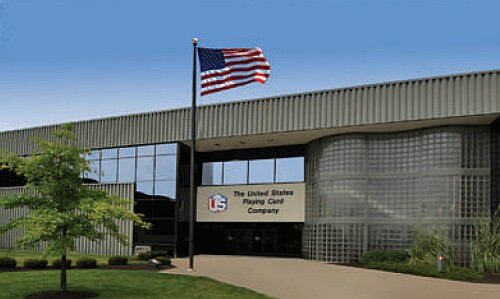 The USPCC has moved their operating plant more than once, most recently from Cincinnati, Ohio to Erlanger, Kentucky, which is the location of their present state of operations. But how do the folks at USPCC actually make playing cards? As it turns out, getting clear information about the manufacturing process at USPCC is a challenging assignment. Unsurprisingly, USPCC itself does not readily disclose details about how they make their playing cards, since they try to keep specific details as confidential as they can. In fact, if you ever do visit their factory, you will likely be required to sign a non-disclosure agreement. While I have never been inside their factory, I have done some research on this point, including talking to and consulting others who are quite well-informed about the production process. I cannot guarantee that the information that follows is entirely accurate on every specific point, but on the whole it should be fairly reliable in giving an overview of how playing cards at USPCC are made. 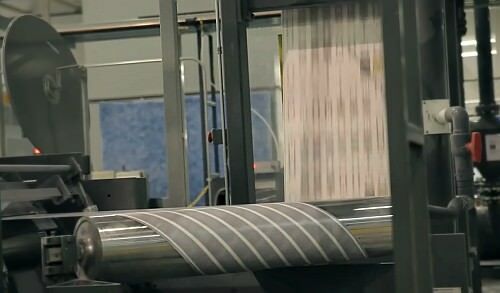 The process at the factory basically involves four main steps, which begins with making the paper stock, printing onto a roll of paper, cutting the sheets into individual cards, and finally assembling the deck. 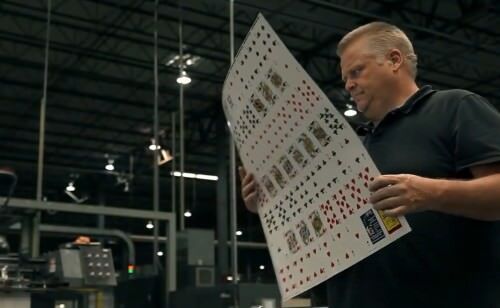 Due to how they are made, playing cards are also called "paste-boards". The process begins with two massive rolls of paper, which are run together through a special laminator. This involves sticking together two sheets with a black colored glue in between, the ingredients of which are a closely guarded secret, and laminating them together permanently by passing them through a kind of heating oven. The black adhesive glue serves the dual function of sticking the layers of papers together, and also making the card stock opaque, which ensures that you cannot see what is printed on the other side when the cards are held up in the light. The paper is then run through a crusher to make sure it ends up at a pre-determined thickness. USPCC is quite unique in that they make their own card stock, and this fact alone gives them significant differentiation from other manufacturers of playing cards. It is also worth mentioning here something about the embossing, which refers to the air cushion style "texture" on the surface of the playing cards, and is now created at a different stage of the manufacturing process than in times past. On most USPCC produced cards, you will notice small dimples or bumps, and these ensure better glide between the cards by creating pockets of air between the bumps, hence this is often referred to with terms like "air cushion finish" or "linen finish". In the present day manufacturing process, the embossing is done when it goes through a roller that presses bumps into the paper. However in older decks, these patterns were caused by the cloth rollers that would apply a coating to the cards after they were printed. Many of the card finish names still used today originated in the names of the fabric used on these rollers, such as linen, cambric, and linoid. Over time, however, with standardization and cost cutting in manufacturing, companies like USPCC started stamping their embossed surfaces onto the paper itself, eliminating the cost of having to frequently replace cloth rollers as they wore out or became too gummed with the coating solution to provide a properly-embossed finish. Even though linen is no longer used for this process, the result does emulate the look and feel of linen cloth, and so various terms like "linen finish" continue to be used. So now we have a 25,000 feet long newly created paper stock on a giant roll, ready for printing. Using digital images received from the deck's creator or saved from a previously printed deck, separate metal plates are created by computer controlled laser etching, corresponding to the images for the back and the front of the cards. These printing plates are mounted on rotating cylinders in the printing press. When the press is running, ink rollers put quick drying ink on these plates, and a rubber roller/blanket will pass over the printing plate and transfer the ink onto the paper as it passes under the rubber roller and moves through the press. For adding other colors, the paper will need to go through another roller assembly which does the same thing. Only one sheet of paper can be printed at a time, but that is where the massively long paper comes in. The paper stock is inserted into a very fast web press, which prints 10 decks of cards every second. Both sides of the deck are printed at the same time. 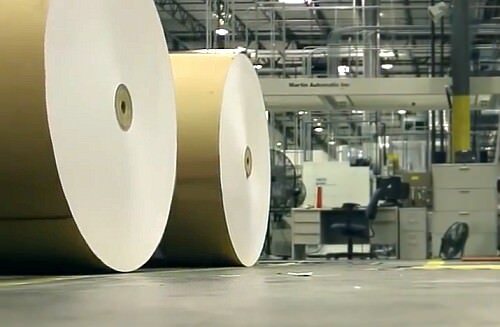 Each roll of paper stock will end up producing around 11,000 decks in total! Once the sheets are printed, a coating is usually added for a final touch, and this is what helps protect the cards and also assists in making them glide over each other smoothly. No coating means no nice fans or spreads! This "finish", as it is sometimes called, also helps seal the cards to protect them from moisture, and can make them last longer and perform better. Once the web press has completed the printing, precision-cutting machines will cut the printed product into what we usually call "uncut sheets". These end up together on a large stack, each sheet representing an entire deck of cards. USPCC produced decks typically have 56 cards (52 regular cards, 2 jokers, and 2 extras), because each such uncut sheet consists of 7 rows of 8 cards. Each deck now consists of a single sheet of paper, so it is time for the cards to be individually cut, which happens in the finishing area. First each sheet is cut into seven long strips, each with a row of eight cards; a process sometimes called "stripping". 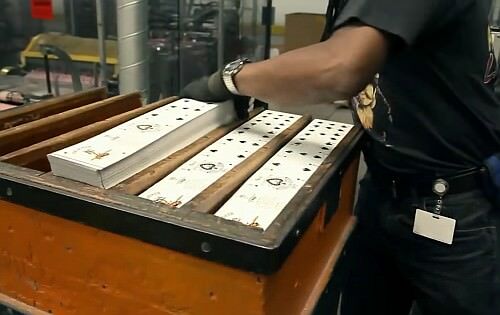 These strips are fed manually into a card punching machine, which "punches" each card individually and rounds the corners, at an astonishing rate of up to 350 cards per minute! With assistance from factory machines, the 56 cards needed for each deck are nicely organized and stacked together, and so made ready for packaging. The completed decks are then assembled into tuck boxes, with the seal added. The completed deck is shrink-wrapped in plastic by a machine, and put into larger boxes for shipping to distributors around the world. Inspections for quality happen throughout the entire process, with technicians constantly checking for any defects or flaws along the way. At the start of a large print run, the plates need to be tested to make sure they produce a quality print. And once production is in progress, the product needs to be checked regularly by line inspectors for printing errors, smeared ink, misaligned cards, or small tears; the final decks are also tested for integrity ahead of packaging. All this quality control means that the decks are nearly always going to be in tip top condition by the time they are assembled in the final stage of the process. Other companies use a similar process overall, but there are some important differences. First of all, USPCC is unique in producing their own card stock. In contrast, other publishers like Legends and Expert Playing Card Company (LPCC/EPCC) operate out of a factory in Taiwan, and import their card stock, receiving it directly from paper mills, many of which are overseas. As a result, the stock that they use in their presses is ready-made with two layers of paper bonded together with colored glue, and often has a range of embossing patterns that are already pressed into the paper. The weight of this pre-made paper can vary, and publishers will sometimes refer to it with numbers like 300gsm, or 310gsm. This represents the weight of the paper stock used, in grams per square meter, and gives a point of comparison between different cards and publishers. Some printers also use a range of different glues, to give options for card-stock with "grey-core", "silver-core", "ivory-core", or "black-core", with the latter typically being the most opaque and the best. These names often reflect the color of the core materials, and different options will also produce cards with different amounts of stiffness or flexibility. Besides the difference in paper stock, another important difference you will notice between publishers is the depth and pattern of the embossing, which can affect the stiffness/softness of how the deck feels, and also how well the cards spread and fan. As mentioned earlier, the process USPCC uses to produce the embossing on cards today is different than in times past, and while previously they achieved this in the process of applying the coating or finish at the end of the process, now they emboss the cards as a separate part of the manufacturing process. In the case of USPCC decks, the embossing is typically the same across their product range. Not all companies do this in the same way, however. Some emboss the cards as part of the printing process, by using a machine that operates like a stamp, or by using metal rollers with bumps on them, pressing down on the cards to make a cross-hatched pattern that creates that distinctive air cushion style finish. Other companies like LPCC/EPCC use imported paper-stock that comes pre-embossed with different patterns and depths, corresponding to what they describe as different "finishes", each of which produces a different feel and results in a different handling. Finally, because the larger web press used by USPCC is used for high volume printing, smaller publishers are not in a position to use this kind of large-scale and expensive equipment. Even USPCC uses sheet-fed presses for smaller orders (e.g. under 10,000), and such a sheet-fed press is typically what many other publishers use for all their orders. With a sheet-fed press, instead of feeding in a giant roll of continuous paper, the paper stock has already been cut into sheets, which are then inserted into the press by feeders. While less efficient, a sheet-fed press can give greater precision in printing and cutting. 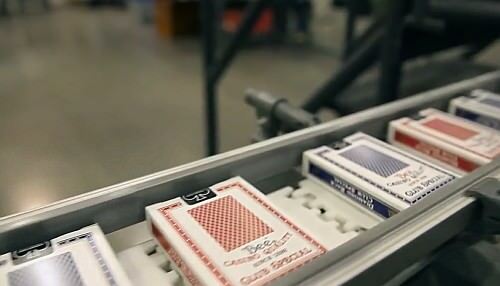 There is a surprising amount of technology that goes into producing a quality deck of cards. You can certainly take short cuts, but that is how you end up with the cheap decks of cards at the corner store, which have no embossing, handle poorly, and just do not last. We can be thankful for how far technology has brought us along the road of progress, and the USPCC has certainly been putting to good use all of the modern tools that are at their disposal. Instead of the ancient pieces of wood, parchment, or paper that made up the first decks of cards, today we are blessed with extremely high quality playing cards that come in a wide range of clearly printed colors and styles, with long-lasting paper, and offer consistent handling. The United States Playing Card Company is one of the industry giants to which we owe a lot for those wonderful playing cards that we can enjoy. Let's hope that they will continue to serve the custom playing card industry well for many years to come! Where To Get Them: Do you want to pick up some quality Bicycle decks? I recommend checking out the range at PlayingCardDecks.com. Start with the tried and true classics: the Red Rider Back and the Blue Rider Back. Or perhaps you might enjoy a variation of the Rider Back deck in one of many other colors or styles. Alternatively, to see the massive full range of playing cards with the Bicycle brand, check out their complete online catalogue of Bicycle Playing Cards.